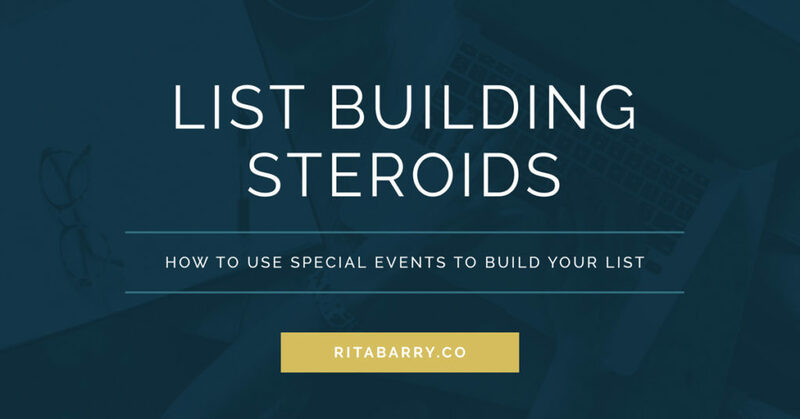 List Building Steroids: How to Use Special Events to Build Your List · Rita Barry & Co. If growing your list is taking forever (or what feels like forever) you may be coming at it the wrong way. While it’s important to have a solid list building foundation on your website to ensure you’re converting as many interested visitors to subscribers as possible, there are also a ton of ways to super charge your list building efforts into concentrated periods of times. If you’ve been watching the “big guys” in your niche, you may have seen these sorts of events happening around you and thought – there is no way I could pull that off. It’s either to technically complicated or I don’t know enough of the “right” people. List Building Events are a great way to raise your profile, get more leads and give your community something to talk about, share and enjoy! List building events, or active list building, can look like a lot of work on the surface, which is why people often avoid them. But you can, and should, go simple! Enjoy the list building benefits of these events without all the headaches that come when we overcomplicate things. There will always be time later to make your events more “polished” if you want but don’t let your vision of perfection hold you back from trying these great list building opportunities. Webinars are great tools to sell products and services but they are also amazing list building tools! Even if you have nothing to sell right now or are not comfortable selling on a webinar, there is nothing stopping you from doing a teaching only webinar to build your list. You can do these events solo but if you want to up the ante even more, doing a joint webinar with someone else can help you both increase your lists even faster. talk to other complementary business owners (similar audience, different products/services) about doing joint webinars where you both advertise the event to your lists. One person can “host” the other or you can both present, whatever works! Choosing a webinar platform that suits your level of technology comfort can be an overwhelming task but if you’re stuck, I have an amazing free resource for you to check out called Webinar Palooza. It was an event hosted by Steve Dotto of Dottotech and he went through a bunch of different webinar platforms and recorded the front facing, client side and back facing admin interface of each software. It’s a great way to see each platform in action and make the right choice for you! A challenge is an event centered around accomplishing or making progress around one specific activity. 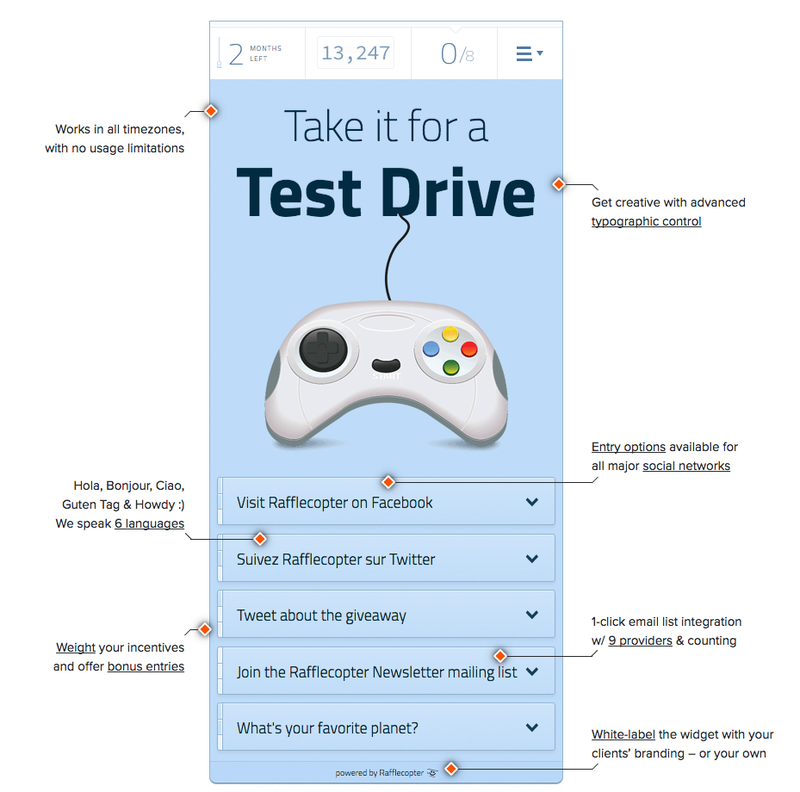 You send out prompts at a pre-determined interval to mobilize your audience into action! Although you can use a challenge as a regular lead magnet, using the challenge as a time sensitive list building event makes it particularly effective at building your subscriber base. Also, when all your subscribers go through the challenge together, you can add a community component which will build your list and business awareness even more. Choose a challenge topic that your audience routinely struggles with and that you can help them overcome by taking small incremental steps. Decide on your challenge duration, something like 7 days or 30 days is popular, and map out what your participants will need to do each day or week to get the desired result. Once you’ve mapped out your content, create a simple landing page on your website and gather emails for the challenge. Add sharing buttons on sign up thank you pages to encourage social sharing and more participants! You can do something as simple as 7 days of emails, with each email being an easy to complete task or a challenge that’s much more involved with videos and fancy pdf’s. But in the beginning, when running your first challenge, keep the duration short and the “designed” features simple so you can focus more on the content. People will remember the results you help them achieve before they remember a fancy pdf design. The ladies from Tone It Up, a fitness and nutrition website, do challenges continually throughout the year to motivate members, create a sense of community, to build their list and to upsell participants into their paid programs and products. Now these ladies have been at this whole business thing awhile so the graphics and the challenge materials, a pdf “starter guide” (you can see an image of the guide in this post), are highly designed and the entire event is super slick. But instead of thinking that you can’t do something like that, take inspiration from it instead of being intimidated by it. They also have amazing ways of mobilizing their community, promote viral sharing of the event and helping their members get results! Online summits are online conferences where one “host” pulls together many different influencers around a certain topic and does multiple webinars. The webinars can be live or pre-recorded, or a mixture of both. Summits are a powerful list builder because each speaker advertises the event to their respective lists. So, if you have even 5 speakers joining you for your summit, you get your name and content in front of 5 different audiences almost instantly! The thing that usually trips people up when they plan their first summit, and I speak from experience here, is that they try to go way too big when you really don’t need to. You don’t need to have 20 speakers in 20 live sessions across 20 time zones and have everyone in matching T-shirts drinking from color coordinated coffee mugs. You will make yourself crazy. What about doing 5 pre-recorded video interviews where you release one interview a day for 5 days? That’s a summit! Seriously, press the easy button, especially for your first one and find the lowest stress way to pull off the event. You’ll still build your list but you’ll also encounter less tech headaches which will make for a better experience all around. What you may find is that you can build your list really fast with just these lower key events and have no need to get fancy with it. You can use all the time you save for other business building activities. 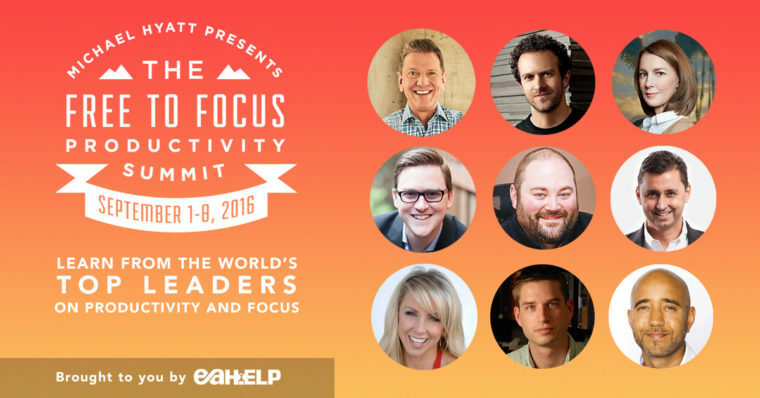 Recently, Michael Hyatt held an online summit based around productivity in promotion of a new course he’s offering. It was a list building event that lead into the launch of the product. Something to note with this summit is that even with a team of people supporting him, graphic designers, video editors, the works, this summit was super simple. There were just 5 interviews, all pre-recorded, and sent out to his registrants once per day for 5 days. The whole event can be done, emails written and scheduled weeks in advance and then you’re just left with the promotion, social media interaction and main marketing push at the time of the event. And oddly enough, normally if I register for an online summit, I’ll catch maybe one or 2 of the speakers, it’s just too overwhelming for me as a participant. With this event, it was really easy to catch all the interviews because it was only 5! Tried and true, a great giveaway can really boost your list numbers but it’s only a good idea when the giveaway is in alignment with your business offerings. You want a list filled with people who are truly engaged and interested in you, your message and ultimately what you sell. A small engaged list is better than a big one that ignores you. For example, it’s easy to get a million emails by giving away an iPad – because everyone would like a free one of those, but that list won’t be incredibly interested in what it is you sell – and that’s the whole point. When running a giveaway something to remember is to add viral sharing elements into the contest to help spread the word farther through social media. This goes beyond the simple, “share this giveaway with your friends” type of promotion and lets people have additional entries when they share across their social media channels. Both of these tools allow for easy entries and viral sharing. You can also have them up and running in minutes! Out of all the methods for list building mentioned in this post, although contests are the quickest to pull off, they are last on my list to recommend. That doesn’t mean they’re bad, it’s just they’re not the best pick, and here’s why. The best way to build momentum in your business and create raving fans who promote your message for you, is for people to get to know you. For your community to feel an affinity for you. With webinars, challenges and online summits, you’re able to get to know your audience better and vice versa. Those events also present you in a place of authority in your space, contents don’t. That’s not to say don’t do a giveaway, it’s just to say keep in mind what your overall business goals are right now and make the right choice for you! I know you’re busy and may be thinking, “Do I really need another thing on my to-do list?” but hear me out. A list building event can do double, even triple duty in your business. Just like the examples we covered, the event gives your audience something to get excited about, it’s a list builder (obviously), but you can also use it for blog content, social media updates, email newsletter topics and more. Reuse, repurpose and get every ounce of mileage out of your event so it saves you time too. What’s one list building event you could plan this quarter to up-size your list?